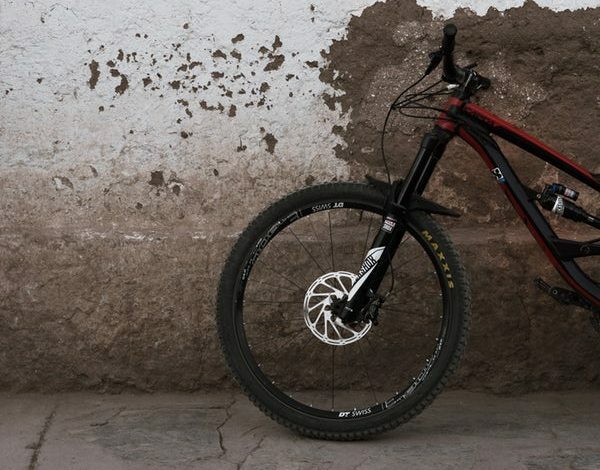 Finding the perfect tire pressure for your mountain bike is more art than science. 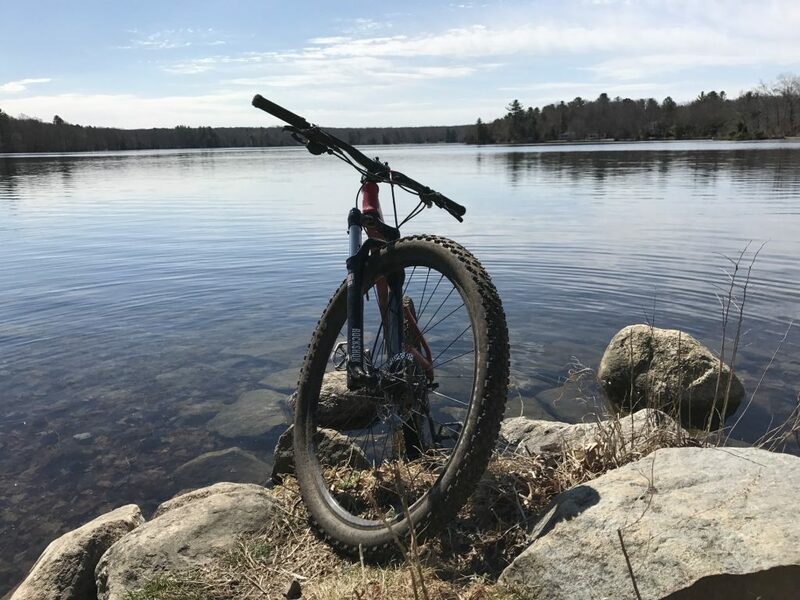 The perfect mountain bike tire pressure is dependant on rider weight, tire volume, terrain, trail conditions, personal preference, and more. Despite all these factors, finding the right tire pressure is worth the effort. A properly inflated tire will increase speed, improve traction, stop pinch flats, and improve overall enjoyment. 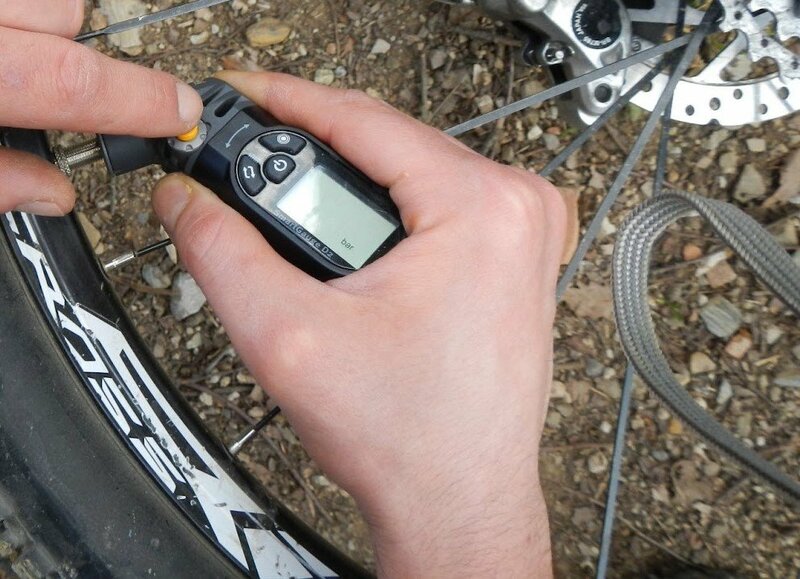 Here are some tips on how to dial in the perfect tire pressure on your mountain bike. Before messing with your tire pressure, make sure you actually own a decent pressure gauge. Most of us (myself included) are guilty of using our hands as a pressure gauge. We squeeze the sidewalls of our tire to “gauge” if we have enough air. While doing this is okay in a pinch, if you’re really committed to dialing in your tire pressure, you should use an actual pressure gauge. You’ve probably also noticed that the gauge on your tire pump is worthless. It will get you in the ballpark but can be off by as much as 25%. Not great for accuracy. We recommend using a digital pressure guage like the Topeak Smartgauge. This will give you a super accurate reading and allow you to figure out the exact pressure you prefer within 1-2 psi. For the best results, always use the same gauge. That way even if it isn’t super accurate, you’re always inflating your tires to the same baseline pressure. The reason that there is no “magic number” for tire pressure is that we each weigh a different amount, have different riding styles and have different preferences. Your ideal tire pressure is going to be different than your friend’s ideal tire pressure. This is evident even when you look at professional racers. Two riders racing on the same course and using the same tires might have their tires set at two different pressures. The first thing you need to consider is your weight. Heavier riders need more air pressure than lighter riders. I’m significantly lighter than my husband, for instance, and ride on average with 10 psi less than him. That’s a big difference. 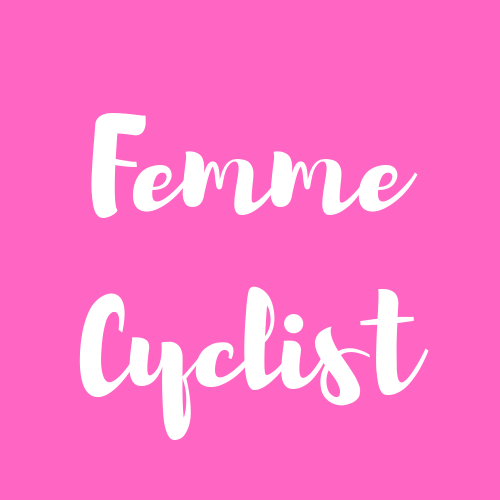 Your riding style and personal preference play a role too. Cross-country racers may choose to run higher pressure in their tires than a rider that prefers to session technical rocky sections of trail. The tire pressure you should run has a lot to do with the tire itself (and the rim it is mounted on). Tubeless setups can be run with much lower pressure than tires with tubes since you don’t have to worry about pinch flats. In fact, this is one of the biggest reasons to switch to tubeless tires. The width of your rim and the width of the tire also play a role. The wider the rim and the wider the tire, the lower the tire pressure that you can get away with. This is one of the reasons that plus-sized bikes have become so popular. They allow you to get away with a much lower tire pressure than you would be able to on a traditional cross-country style tire. Finally, consider the construction of the tire. Tires with higher TPIs (threads per inch) should be run at a lower pressure than tires with a lower TPI. Where you’re riding and what the current conditions are like should also affect your choice of tire pressure. 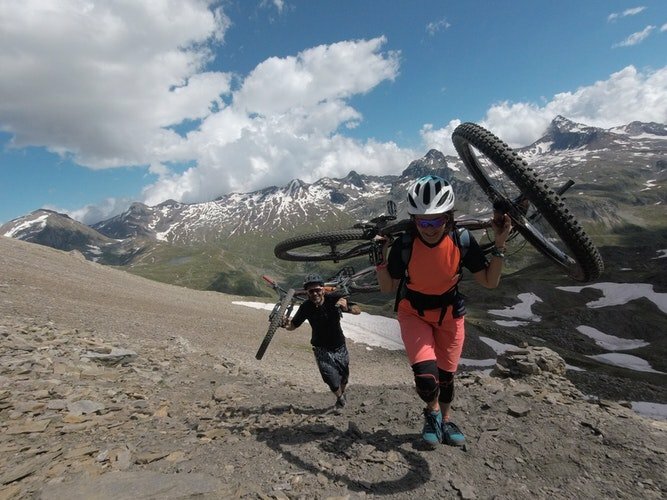 Riding rocky, rooty terrain? Lower your pressure. Riding smooth, buff trail? Bump it up a little. Even when riding the same trails, your tire pressure may change a bit from one day to the next. The lower your tire pressure, the better your traction, so let out a little pressure for snow, ice, or mud. The moral of all this? Don’t be afraid to play around with your tire pressure! Bring your gauge and a pump to the trailhead. Heck, you can even bring your gauge out on the trail and experiment. If you’re really serious about testing out your tire pressure, set up a little course and experiment with different pressures. Start with the maximum pressure listed on your sidewall and time yourself. Next time, let out a few PSI and time yourself again. Repeat until you stop making time gains or until the tire starts feeling squirmy. Also, remember: tire pressure isn’t just about going faster. When you experiment with tire pressure, pay attention to what FEELS good to you. Where do you feel like you have enough traction? How much plushness do you prefer? 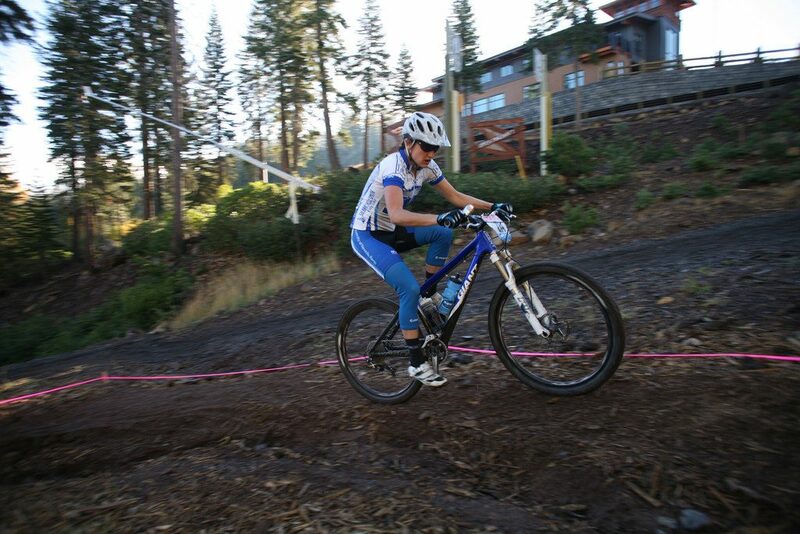 What tire pressure makes you feel confident riding over obstacles? Practice until it’s perfect. You can also play around with running different pressures in the front and rear tires. The front tire receives less weight distribution than the rear so you can usually get away with running a little lower pressure in the front tire. Try running the front at 3 PSI less than the rear and see how that feels. If you read everything above, you’ll know that you’ve got to spend some time fine-tuning your tire pressure. That said, you have to start somewhere, right? Here’s a quick cheat sheet for setting your tire pressure. Just make sure you keep adjusting until you find your own personal sweet spot. Remember, this is just a starting point! If you look at the sidewall of your tires, you’ll notice a “recommended” tire pressure range from the manufacturer. This is a legal thing and shows what they consider the max pressure and the min pressure. If you put too much pressure in a tire, it could blow off the rim. Too little pressure and you can damage the rim. While your ideal tire pressure is likely within this range, it’s okay to experiment outside of it as well. While it’s unlikely that your ideal tire pressure is higher than the maximum pressure, it could be lower. Smaller and more petite women who don’t weight much are often better served by a lower tire pressure. At 120 pounds, I personally often run my tires at a few PSI lower than the recommended pressure listed on my tires.